These blasters revolve around the use of a pair of motors to fling darts out of the blaster. Generally speaking, these motors drive two flywheels, spinning opposite each other, which grab darts as they are pushed between the wheels. This can be done manually (directly linked to trigger pull) or though the use of a motorized feeding system (Hyperfire belt, Rapidstrike pusher, etc). All of this is powered by a battery source, eliminating the need for any type of manual priming or pumping, but requiring an entirely different skill set when it comes to blaster modification. This is not meant to be a how-to guide for modding blasters, as plenty of good ones already exist. It is meant to help understand how things work on the inside, as well as why you may see certain modifications being done. I'm also going to shy away from accessories. 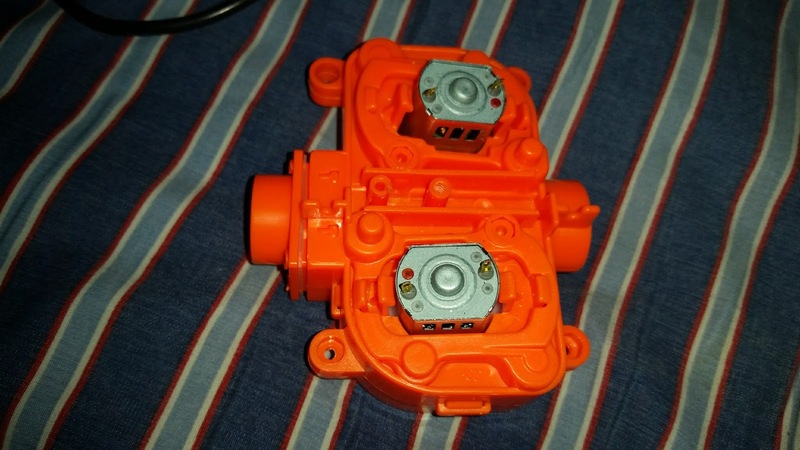 Meishel 2.0 motors, sitting in a Nerf Modulus Regulator cage. Motors - These draw current from the battery and convert electrical power into physical motion (spinning motor shaft, etc). Flywheels - The wheels mounted on the motor shafts. These are the parts that come in contact with darts. Cage - The (usually plastic) assembly that holds the motors and flywheels in position as a single unit. Switch - Used to turn a circuit on and off. 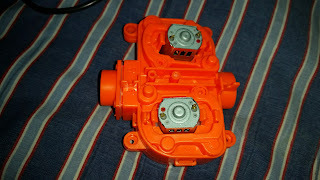 Flywheel blasters will have multiple switches fulfilling different functions. Rev triggers will have a switch that turns on to feed power to the motors. Many blasters have safety switches that only complete the circuit under specific circumstances (magazine present, jam door closed, etc). Meant only for low currents. Battery - Uses electrochemical cells to supply stored energy to a system. Most stock flywheel blasters use alkaline batteries. Thermistor - A resistor that varies in value with temperature. PTC (positive temperature coefficient) thermistors are often included in flywheel blasters to prevent blaster damage. If too much current is present, the system will bleed off some power as heat. The PTC thermistor will respond by increasing its resistance and reducing the current. It's a safety mechanism. Upgraded blasters almost always see their removal. A slotted link mechanism, similar to that of a Rapidstrike pusher. Pusher - A general term for the mechanism feeding darts into the flywheels/into the cage. Semi-auto blasters like the Stryfe have a physical linkage attached to the main trigger. Rapidstrikes have a motor connected to a series of gears and a slotted link mechanism to produce. Hyperfires have a motor driving a rubber belt sitting above the dart magazine. 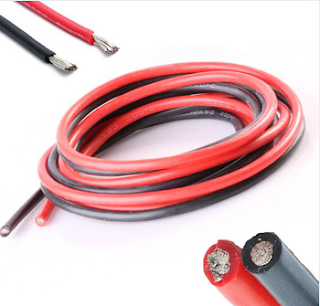 Wire - an overlooked but important component, since it carries the electrical current. Stock blasters have very thin wires, meant only for the low current provided by alkaline batteries. 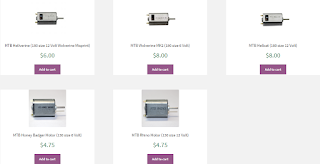 Random - Manufacturers will have many other components added that serve to either make function more consistent or to meet standards like preventing RF interference with other electronic devices. These generally are removed upon modification, but it's important to know that they're initially present in the blaster for a reason. Electric-powered blasters require component upgrades if you want better ranges, rate of fire, or blaster endurance. I'll try to give a good overview of each thing. A selection of motors, as seen on the Containment Crew website. Stock flywheel motors will only draw a low amount of power for firing darts. To improve performance, better motors have to be installed. Think of it as replacing your inline four with a V8. Granted, you have to upgrade all associated systems, and have room to do it. Just don't stretch my analogy too far, ok? There are a large number of aftermarket motors in existence, all with varying power requirements and specifications. THIS DATABASE offers a good summary of their characteristics. Because modded flywheel blasters usually operate from Lipos or from other high-output batteries, motor specs will usually be seen in relation to that. Match motors to the battery you'll be using. In addition, use motors that will fit. Stock dart blaster motors are usually 130-size motors. Larger motors (132, 180) may require cutting holes in the shell to accommodate the extra length, although the larger size will also correlate to more power. Torque describes how much rotational force the motor can apply. When darts enter the flywheel cage, the flywheels slow down after imparting energy to the now-flying dart. Motors with higher torque can more quickly bring the flywheels back up to their no-load rotational speeds, making future shots perform more consistently. This becomes extremely important when using fully automatic blasters. Electric motors exert the most torque and use the most current when stalled (at startup, or if a dart jams inside the flywheel cage). It is good practice to rewire your blaster and choose batteries that can supply these high currents when necessary. That being said, if you have a dart stuck, TURN OFF YOUR BLASTER. With the motors stuck, all that current is being converted straight into heat, and you can burn things up quite nicely by mishandling your blaster. 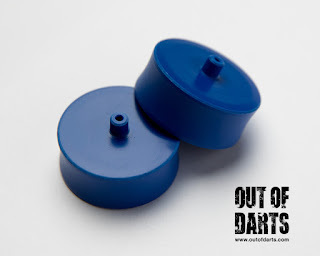 Blasterparts Flywheels, picture from the Out of Darts Etsy store. Flywheels are a critical part, and yet (for modding purposes) are one of the most expensive things to upgrade. Blaster manufacturers use injection molding for most plastic parts due to the needs of mass production. For stock blasters, this is fine. For upgraded blasters running new motors and higher RPMs, flywheel imperfections become apparent with lots of noise and less than optimum performance. It's like driving a car with improperly balanced tires. As a result, there is a market for replacement flywheels, almost always machined to tight tolerances for both better performance and noise reduction. Replacing the cage is usually unnecessary. However, there are cases where a new cage will benefit users. For example, Hyperfires use canted cages - the motors are physically offset at an angle in order to induce a small amount of dart spin. This helps the accuracy of Elite darts at stock velocities, but upgraded motors tend to cause the darts to simply whirlybird out of control and not fly very far. Open Flywheel Project makes straight cages that fit within the shell in order to correct this issue. 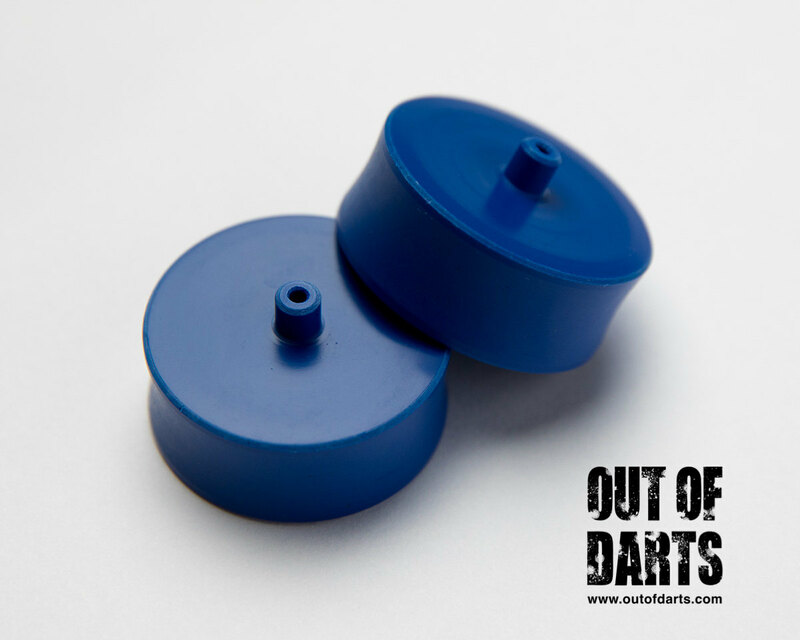 In addition, aftermarket cages offer the ability to space the motors more closely in order to apply more crush to the darts. Essentially, the goal is to more tightly grip the dart head and spit out the dart, transferring more energy from the flywheels to the dart than before. This can result in higher dart velocities, but at the cost of wearing the darts faster. In addition, more current is needed because the motors have to apply more torque, and some darts with harder heads will more easily jam and stall the motors. Higher crush can have its uses, but there are disadvantages as well. A 15A microswitch, and a generic MOSFET. Stock switches in blasters are only meant for low current. This leaves a few option for those upgrading their blasters - replace the switches, or use them to trigger something else. Almost universally, safety switches will be removed, leaving only the ones necessary for operation. It's implied that if you're smart enough to redo the blaster circuitry, that you're also smart enough to operate your blaster safely without the extras. 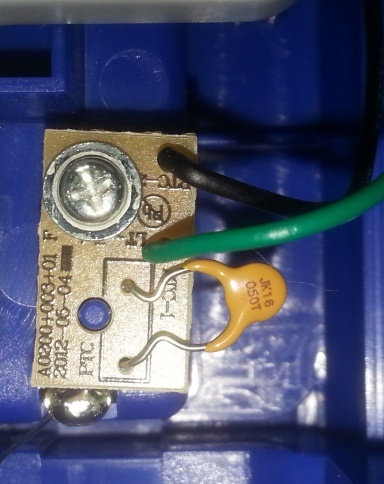 In many cases, higher amperage microswitches are installed. These can handle the higher currents required by new motors, although they usually require manually cutting out parts of the shell in order to fit them inside. Even so, since upgraded blasters need their wiring replaced in order to handle the higher currents anyway, replacing the entire circuit is always a viable option. There are options that involve less shell modification, however. Components like relays or MOSFETs are designed to allow low currents to turn on high current circuits. In these cases, you can keep the stock switches and associated wire IF AND ONLY IF they serve to trigger the control circuit on the relay or the gate of the MOSFET. As long as sufficient space is free within the blaster, you can run better wire from the battery to the motors and back, with the MOSFET or relay serving as the junction point where the old system ties into the new one. Above stock performance, batteries become critical pieces of the puzzle, as you not only need to supply higher voltages, but also higher currents. There are several battery types, many of which may require external connections or otherwise may not fit within the existing battery tray. All with be rechargeable. Cylindrical cells - Various rechargeable batteries in standard sizes (14500 = AA, etc) do exist, but should generally be avoided unless it's a specialty cell designed for high current or a particular usage. For example, this Lithium IMR battery (assuming the listed specs are accurate) is only rated for 6.5A continuous current. Unless you're running stock or low-powered motors, you will be abusing the battery's ability to supply current and potentially damaging it. If the battery says it's not meant for e-cigarettes/vaping, that should be a red flag that it's not meant for high-drain applications. As always, exceptions exist. But don't base your blaster on exceptions. Go with what works. The more assumptions you make, the more likely that something will go wrong. For the love of all that is Nerfy, if you insist on using regular Lithium-ion cylindrical cells, ONLY USE IMR CHEMISTRY, DESPITE WHAT OLD YOUTUBE VIDEOS MAY SAY. That's the safest chemistry for that kind of battery, and is less likely to have something go wrong. The more recognizable the brand (Sony, etc), the more likely the specs are right. Finally, note that stock battery trays cannot much current beyond what alkalines supply before spring contacts heat up, and parts melt. Seriously, if you have to replace this much, just go for a proper rechargeable battery pack. For a break from reading, see this video from Foam Data Services. The rest of this section will deal with rechargeable battery packs, which are designed for high current use. All will use some type of female connector (Deans, XT60, etc), which means your blaster will need a male connector of its own to allow you to plug them in. NiMH - A classic staple of rechargeable batteries. They are heavier than alkaline batteries of the same size, but have a much higher energy density and low internal resistance. Often used in airsoft batteries, and very reliable. Nominal voltage is 1.2V per cell. Not the best option, but very affordable and can handle low to medium currents. Lipo - Nominally 3.7V cells. Instead of a solid-case battery with a liquid electrolyte, these use a polymer electrolyte. A such, Lipos can be made into soft packs of varying shapes and sizes, usually with both high energy density and high discharge capabilities. Popular in both airsoft and paintball, and as such also very useful for electric Nerf blasters. Take proper care of them (follow manufacturer directions, don't short circuit, don't leave baking in your car on a warm day), and they'll take care of you. Fully charged cells are at 4.2V each, and discharge down to 3V. Do not discharge below 3.0V. LiFePO4 - Nominally 3.2V, and different enough in use for me to give it its own category. Among lith-ion chemistries, it is one of the safest available, and it highly resistant to abuse (I AM NOT ADVOCATING ABUSING YOUR BATTERY). It also tends to keep a consistant voltage through its discharge cycle and allow better charge and discharge rates, although energy density is lower than in Lipos. Fully charged cells are usually at 3.6V, and can operate down to 2.8V. At the moment, Lipos are still the easiest investment in terms of cost, reliability, and capacity. Generally speaking, the only thing that happens with pushers is the replacement of the motor, in order to match the power source. In some cases, however, extra circuitry can be added to allow a lower rate of fire, to make it variable, or simply to make it more precise. For example, Pulse-Width Modulation (PWM) boils down to rapidly turning the motor on and off in order to lower the effective rate of fire, which is handy for blasters like the Nemesis that can shoot 18 balls per second on full blast. A lower voltage motor with step-down voltage convertors keeps a low rate of fire, but allows no variability. Rapidstrikes are often wired with an additional limiter switch to ensure that, once the main trigger is let go, the pusher fully retracts. In addition, kits exist that add full-auto capabilities to blasters like the Stryfe, using a rack and pinion mechanism for the pusher. These however endure lots of stress and are less reliable. Burst-fire does exist, most notably in the Nerf Modulus Regulator, but that is enabled by specialized electronics and programming, not the speed at which the motor is running. An example of stranded silicone hobby wire. Pipes are rated for certain volumes of water to flow through them at a certain pressure. The water flowing inherently meets some resistance with the pipe walls, etc, and ultimately if you need higher flow you need a larger diameter pipe. The same applies for electrical wire. If you don't want to bleed off energy as heat and want the proper current flow for the items downstream to work properly, you need larger diameter wire. Any heavily modded blaster will need new wire running between the replacement battery and the new motors. Stock wire is too thin to carry enough current. Hobby wire is flexible and easy to work with, but more expensive. Primary wire is stiffer, but less expensive. Avoid the stiffer stuff from your hardware store that's just meant for buildings. Stranded wire should always be used, as it won't fatigue from the constant movement or vibration the way that solid wire will. Given the small lengths of wire we're using (I have yet to see a ten foot long blaster that needs twenty feet of wire), 16AWG is the minimum diameter wire you should be using. In short, if the wire somehow leads to the motors, replace it. This is a great comparison between the two gadgets and allows the buyer two make the right decision. I cant decide, so I will be purchasing both. You did a good job in this article and this kind of the information is always so important. The concept that you deliver in this article is so nice and you share the information that needs the time. I really enjoy this whole article. Can you tell me where the Thermistor is located in the Regulator? I don't wanna go prying around, just wanna get in there and get it done, to run on two 14500 cells and two dummies.